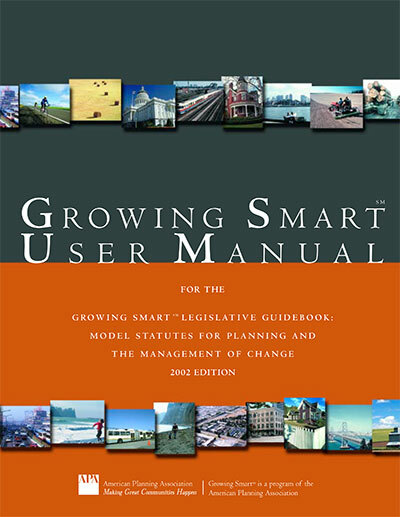 The Growing Smart Legislative Guidebook and its accompanying Growing Smart User Manual are the culmination of APA's seven-year Growing Smart project, an effort to draft the next generation of model planning and zoning legislation for the United States. States and their local governments have practical tools to help combat urban sprawl, protect farmland, promote affordable housing, and encourage redevelopment. In the belief that there is no "one-size-fits all," the model statutes are presented as alternatives that can be adapted by states in response to their particular needs. 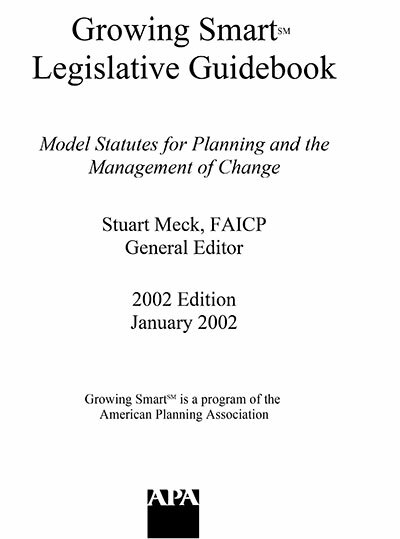 The Growing Smart Legislative Guidebook: Model Statutes for Planning and the Management of Change, 2002 edition, was published by the American Planning Association in January and is available for downloading. Here's a summary of what's in the Guidebook. The Introduction describes the background and philosophy of the Growing Smart project as well as the organization of the Legislative Guidebook. Initiating Planning Statute Reform discusses how to begin planning statute reform through the state legislature, the governor, and private interest groups. It identifies several institutional mechanisms, including special study commissions composed of state legislators, independent study commissions, task forces composed of legislators and nonelected officials, private coalitions, and joint legislative study committees. The chapter also reviews specific approaches that will help ensure the reform initiative's success (regardless of which organizational vehicle is selected). Finally, it provides three model statutes and two model executive orders that describe the structure and authority of the various institutional alternatives. Purposes and Grant of Power examines purpose statements -- language that indicates why state planning legislation was enacted and what it is intended to accomplish. The purpose statements contained in the model statutes provide four alternatives posed as fundamental policy choices for state legislatures: (1) planning as an advisory function; (2) planning as an activity to be encouraged through incentives; (3) planning as a mandatory activity necessary in order to exercise regulatory and related powers; and (4) mandated state-regional-local planning that is integrated both vertically and horizontally. The model legislation then describes a series of long-range state interests that all levels of government must take into account when exercising planning authority. Finally, the legislation includes language that grants planning powers to local government. Definitions assembles in one location all of the definitions of "general applicability" that are used in the Legislative Guidebook. Specific definitions that are pertinent only to particular model statutes are located elsewhere in the Guidebook..
State Planning proposes legislation that establishes various types of state planning agencies, describes their functions, and details different types of state plans and procedures for their adoption and use by state agencies. Some state plans are intended as vehicles simply to formulate policy or create a "vision" for the state. Others have regulatory implications for state and regional agencies and local governments, such as plans for affordable housing and state biodiversity conservation. The chapter includes a model state capital budgeting and capital improvement programming statute, and concludes with a Smart Growth Act based on a Maryland law. State Land-Use Control includes model legislation for: (1) siting state facilities; (2) designating areas of critical state concern; and (3) regulating developments of regional impact (DRIs), which are developments that have multijurisdictional impacts. Regional Planning proposes statutory alternatives for the formation and organizational structure of regional planning agencies. The model legislation describes a full range of functions and duties for such agencies. It details the contents of regional comprehensive and functional plans (such as those for housing and transportation) and procedures for their adoption. A special feature language for the designation of urban growth areas within a regional comprehensive plan. The chapter also proposes a variety of implementation tools, including the review of plans of state agencies, local governments, and special districts and of major capital projects of extra-jurisdictional or regional significance. Further, the chapter includes model legislation for agreements between the regional planning agency and other governmental units to implement regional plans. Finally, a model statute is provided for the designation of the regional planning agency as a substate district organization. Local Planning authorizes planning at the local level of government. It is divided into four parts. The first part addresses the role of the planning function in local government -- how the "local planning agency" is established, what its relationship with the legislative body and chief executive officer should be, and what are its powers. Several alternatives are advanced for the structure of a local planning commission. This part also provides a role for neighborhood planning councils and independent neighborhood and community organizations. The second part details the contents of a local comprehensive plan in terms of a mandatory set of elements (if the decision is made to mandate local planning) and optional elements. The section also describes different subplans that are focused on specific areas, like neighborhoods, transit stops, and redevelopment areas. In addition, the text includes model language that describes systems for land market monitoring to ensure an adequate supply of buildable land. Such a system would be required if the local comprehensive plan contains urban growth areas, which are described in Chapter 6, Regional Planning. The third part sets forth procedures for plan review, adoption, and amendment. The plan review component contains an optional procedure for state approval of regional and local comprehensive plans, with an appeal to a state comprehensive plan appeals board. Municipalities would also be able to appeal to the board urban growth area designations by a regional or county planning agency if agreement cannot otherwise be reached. Another innovative feature of this part is its express provision for public collaborative processes in plan-making that goes beyond the simple requirement of the single public hearing advocated in Section 8 of the Standard City Planning Enabling Act (1928). It offers a model statute to guide local governments in ensuring that the plan preparation process engages the general public. The fourth part describes measures that carry out the plan and monitor its implementation, including corridor mapping and local capital budgeting. The section also includes a description of agreements with other governmental units and nongovernmental organizations, which are identified in the local comprehensive plan as having implementation responsibilities. It also provides for the establishment of benchmarking systems to measure and track performance in achieving the goals of local plans. Local Land Development Regulation contains model statutes that authorize local governments to adopt a variety of development regulations. Topics covered include zoning, subdivision, planned unit development (PUD), uniform development standards, exactions, development impact fees, vesting, nonconforming uses, and development agreements, among others. A feature of the chapter is model language to gauge consistency between a local comprehensive plan and land development regulations or specific development proposals. Special and Environmental Land Development Regulations and Land-Use Incentives contains model statutes that address various special issues in land development regulation, including environmental issues. The protection of, and regulation of development in, critical and sensitive areas and natural hazard areas is addressed in Section 9-101. Section 9-201 is concerned with transportation demand management. And Section 9-301 authorizes regulations for the protection of historic properties and districts and for the preservation of aesthetic design standards in specific districts. The second group of statutes provides flexible tools for balancing the need to protect the public and the environment with the rights of property owners. The first two sections in this group, 9-401 and 9-402, authorize transfer of development rights from one property to another and the purchase of development rights by the local government. The section on conservation easements, 9-402.1, provides the legal instrument through which the transfer or purchase of development rights is implemented. And the mitigation Section, 9-403, authorizes local governments to permit development in otherwise-undevelopable critical and sensitive areas, such as wetlands, in exchange for the creation or restoration of replacement critical and sensitive areas elsewhere. A final model statute, Section 9-501, authorizes land development regulations that provide density and intensity incentives for affordable housing, good community design, and open space donation. Administrative and Judicial Review of Land-Use Decisions presents model legislation for the review of development permit applications by local governments, and judicial review of land-use decisions on these permits. It is intended to be a complete law, but it also contains such a range of options and ideas that it is possible to pick and choose from the alternatives when drafting legislation. Part one contains definitions and other provisions to be used throughout the chapter. Part two describes the components of a unified development permit review process. Parts three and four contain authorizing legislation for a hearing examiner who could assume a variety of land-use advisory and decision-making responsibilities and a Land-Use Review Board that would replace the board of adjustment or zoning appeals. Part five describes a variety of administrative actions and remedies that a local government could authorize, including variances, conditional uses, and an experimental proposal for mediated agreements to modify the land development restrictions that apply to a property. Part six describes a uniform procedure for judicial review of land-use decisions. Enforcement of Land Development Regulations addresses the manner in which local land development regulations are enforced. It stresses pursuing administrative remedies before resorting to judicial measures. Under these models, informal enforcement is the initial option. Should more formal means be required, the chapter provides model language for official notice to alleged violators, procedures for issuing preliminary orders and conducting enforcement hearings, and methods for enforcing final orders. Where administrative action is not or would not be successful, the local government can pursue judicial relief, through civil and criminal proceedings that ensure compliance. Integrating State Environmental Policy Acts with Local Planning discusses ways of evaluating the environmental effects of local comprehensive planning and the problems of integrating state environmental policy acts, where they exist, into local planning. It provides three statutory alternatives. Alternative 1 requires the local planning agency to prepare a written environmental evaluation of several elements of its local comprehensive plan in order to understand the significant effects of the plan on the natural environment. In contrast to Alternatives 2 and 3, which follow, this alternative is not binding on the local government in a regulatory sense and does not involve a state environmental policy act that applies to specific projects or land-use actions, such as single-tract rezonings or conditional use permits. Alternative 2 presumes the existence of a state environmental policy act. The purpose of this alternative is to authorize the preparation of an environmental impact statement on a local comprehensive plan so that public agencies can avoid or carry out a more limited environmental review of land-use approvals that are based on that plan. By contrast to Alternative 1, this alternative is more complex in that it goes beyond being a mere environmental evaluation with no regulatory implications. Finally, Alternative 3 integrates the consideration of environmental impacts under the state environmental policy act with the review and approval of land-use actions by a public agency. Financing Required Planning contains various model statutes that authorize methods of financing the planning activities authorized and required elsewhere in the Guidebook. Sections 13-101 through 13-103 authorize local governments to adopt and impose taxes to finance planning: a property tax, real property transfer tax, and a development excise tax. Section 13-104 is concerned with the dedicated purposes to which the special tax revenue may be put. Section 13-201 is the Smart Growth Technical Assistance Act. It creates a state program under which grants may be made to regional planning agencies and local governments to support their "smart growth" planning activities. Tax Relief Devices and Tax Equity Programs discusses alternative approaches used to address fiscal disparity -- differences in revenue-raising capacity among local governments that are a product of the type of development that occurs. Two model statutes are presented: (1) regional tax-base sharing legislation, by which the growth in commercial, industrial, and high-value residential components of the regional property tax base is shared among local governments; and (2) a statute permitting a voluntary intergovernmental agreement among two or more units of local government to create a joint economic development zone. The contracting governments negotiate which public services and facilities are to be provided in the area that is to be included in the zone, and which tax and other revenues that result from commercial, industrial, and other development will be shared, and in what amounts or proportions. The chapter also contains model legislation for redevelopment, tax increment financing, and tax abatement. It includes a model law for designating agricultural districts, special areas where commercial agriculture is encouraged and protected. Land within such areas is then assessed at its use value in agriculture rather than its market or speculative value, a concept called "differential assessment." The chapter concludes with a research note on public school finance and its relationship to planning and development prepared by Prof. Michael Addonizio of Wayne State University in Detroit. State-Level Geographic Information Systems and Public Records of Plans Land Development Regulations, and Development Permits. This chapter proposes model legislation for state-level geographic information systems (GIS). GIS is a computerized system that stores and links spatial or locationally defined data. Increasingly, state governments are establishing, by statute or administrative or executive measures, formal structures within them to manage, coordinate, and analyze geographic information. Section 15-101 establishes a division of geographic information in the state planning agency (although the function could be placed in any appropriate state department). The division is charged with operational responsibility for establishing and maintaining the state GIS, along with affiliated functions such as administering grant programs to local government and providing access to training. It also has rule-making authority. A Geographic Information Advisory Board provides general policy advice to the division under Section 15-102. The chapter also proposes statutes, in Sections 15-201 to 15-203, to ensure a permanent, easily accessible central storage of the rules and decisions that control or guide land development, including plans, land development regulations, and development permits through a system of public records. This User Manual is intended to assist those interested in planning statute reform apply the materials in the Growing Smart Legislative Guidebook: Model Statutes for Planning and the Management of Change to develop innovative programs that are tailored to the needs of their own states. By means of checklists and case studies, users can select from the options available in the Guidebook and tailor a program of statutory reform that will meet the unique needs of their state. The American Planning Association has prepared this Legislative Guidebook, which contains model statutes for planning and the management of change as well as commentary that highlights key issues in the use of the statutory tools by states, regional planning agencies, and local governments in their use. A short annotated bibliography of books and publications on reform of state planning statutes. This is downloadable as a file. It includes state-specific reports proposing changes in planning statutes or procedures, including reports of state study commissions and monographs on the implementation of existing planning programs. Also included are related articles and reports on innovative approaches to legislative reform or commentaries that have implications for new legislation. A longer annotated bibliography of books and publications on planning statute reform, growth management, land use controls, subdivision, zoning, and related topics. The basic foundation for planning and zoning in the U.S. was laid by two standard state enabling acts published by the U.S. Department of Commerce in the 1920s. Learn more about the project advisors who were appointed by the nation's major organizations representing elected officials. Financial support for the project was provided by the Henry M. Jackson Foundation, the Annie E. Casey Foundation, the U.S. Department of Housing and Urban Development (the lead federal agency), the Federal Highway Administration and the Federal Transit Administration in the U.S. Department of Transportation, the U.S. Department of Agriculture Rural Economic and Community Development Administration, the Federal Emergency Management Agency, the U.S. Environmental Protection Agency, the Siemens Corporation, and APA members.